Lava Loot is a really fun and colourful slot packed full of entertaining features and feel-good music and sound effects. It’s a total joy to play and offers many opportunities for players to get big payouts. Head back to pre-history with this Flinstone-esque slot and join the caveman and woman who are living underneath a volatile volcano! You’ll be sharing your sleeping quarters with dinosaurs, caged-creatures, discarded bones and the occasional lake of molten lava! The aim of the game is to spin at least two or three matching symbols (depending on the symbol) in a winning combination in order to get a payout. Lower-paying symbols include card values from 10 through to Ace and both the blue and purple friendly dinosaurs – no Jurassic Park style creatures here! 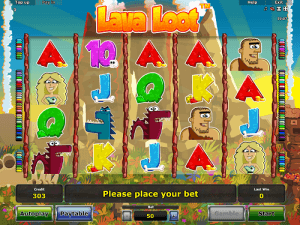 The caveman and woman pay out up to 8x your bet and the ‘Lava Loot’ symbol pays out up to 20x your bet. The Wild symbol in Lava Loot is a caged creature, who actually seems quite happy to be locked behind bars, and he and his prison substitute for all symbols except the Scatter symbol, which is a volcano picture with ‘Bonus’ written in the foreground. Fans of our other slot games, such as: African Simba, Book of Ra Deluxe and Dragon’s Wild Fire will enjoy this creative, cartoon-y game. It’s also a great game for intermediate slots players, who are bored of the basic 3 or 5-reel, bonus-free slots but who don’t need something super, super complicated either. Your winnings are clearly displayed for you at the bottom of the screen on the right, your balance is always on the right and your bet amount in the middle. You can increase or decrease your bet at any time and you’ll be able to consult the paytable to see how much each combination of symbols will pay out, according to your current bet, and for more information on the game. There are two different bonuses you can get in this slot game. The first is the Big Wild Bonus which can be triggered at any time! It will happen randomly and you’ll see and hear the ground start to shake before the volcano starts to erupt! A Big Lava Wild symbol will slide down the reels like molten lava, taking over reels 2, 3 and 4. It can stop at any time, covering one, two or all three rows of these middle reels. The more rows it covers, and the more matching symbols to either side, equals a bigger and better payout! The other bonus in this game is the Lava Loot bonus, and this is triggered when you spin three or more Scatter ‘bonus’ symbols. The Lava Loot bonus includes 10 free spins with Lava symbols. These Lava symbols substitute for every other symbol except the Scatter, and will stick to the reel it’s landed on, moving one row down each spin until it disappears from the reel. During the free spins, more free spins can be won when two or more Scatter ‘bonus’ symbols appear on the reels. The gamble feature in Lava Loot means you don’t have to just sit on those wins, you can gamble them! There’s a 50/50 chance you’ll double it! Like those odds? Click ‘gamble’ when you get a payout and choose between red or black for the colour you think the next card is going to be. If you guess right, you’ll double your win and you can have another go to quadruple it. However, get it wrong and you’ll lose your win and head back to the reels with nothing. You’ve been warned!